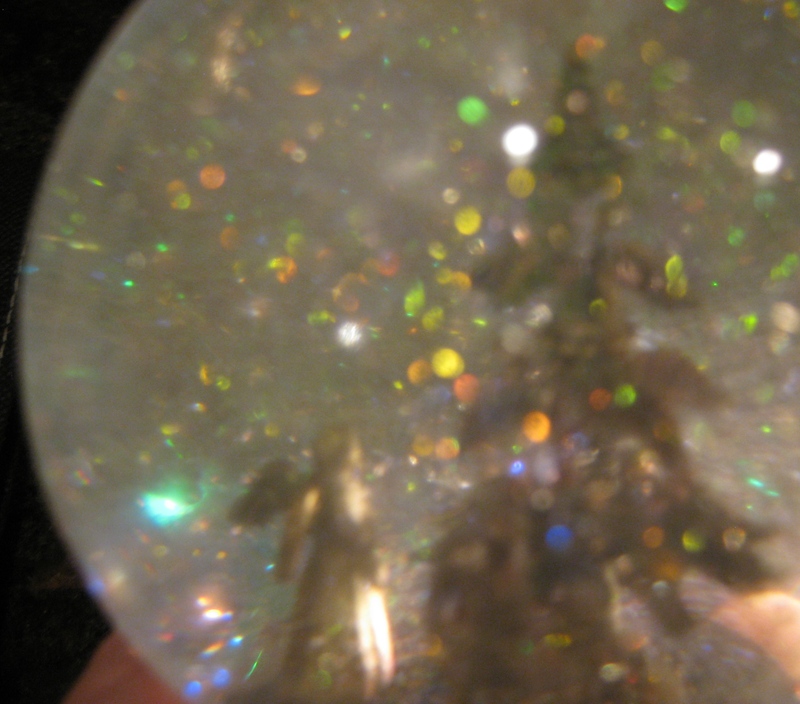 In this snow globe, the tree itself is made of angel wings of different sizes and metals. A winter-dressed couple strolls peacefully, enjoying a quiet moment together. A father and child hurry home, excited to share warmth and surprises. A winged figure in a moment of solitude reflects upon the tree itself. When shaken, you might (or might not) see a whisper of an angel: the silhouette of a winged beauty, so transparent it can only be glimpsed when the light captures the perfect angle. For just a moment, a flash, it is there, and gone again. And I realized that is how most of us see angels, not by viewing them directly, but when we are caught in the reflected light. When this globe is shaken and catches the light, you see an abundance of sparkling color, shimmering, swirling, floating, dancing and flying with abandon. If you are lucky and don’t blink, you might even catch a glimpse of an angel. Glimpes of Angels: One of a kind custom snow globe, with metal tree made of repurposed vintage jewelry and jewelry findings (angel wings) and metallic figures. All photographs and designs are copyright (c)2013 Camryn Forrest Designs, Denver, Colorado.